A retired pro snowboarder from Vancouver believes his new company, Envia, can beat major auto manufacturers in the race to make electric vehicles commercially viable. A retired pro snowboarder from Vancouver believes his new company can beat major auto manufacturers in the race to make electric vehicles commercially viable. Jay Giraud, founder and CEO of Vancouver-based Envia, says auto manufacturers have been moving too slowly into the electric vehicle market. "I just noticed there had become this massive gap between where the auto industry was going and where the public wanted it to go, and I saw a niche." 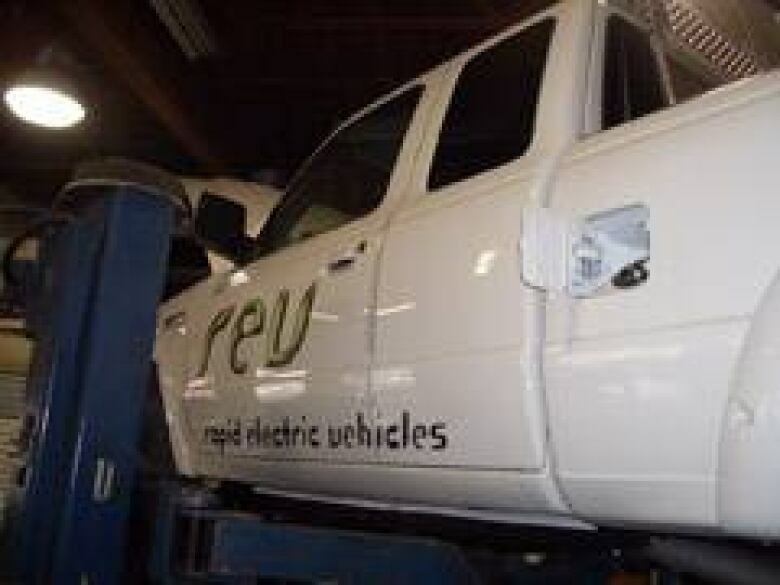 Vancouver-based Envia specializes in converting Ford trucks into electric vechicles. ((Courtesy Envia))In the late 1990s, Giraud was one of the top snowboarders in the country, but in the past few years, he has shifted gears. About three years ago, Giraud decided he want to help change the auto industry and be part of the shift towards green technologies. "Ever since I was a kid I thought cars should be electric," he says. Giraud entered the auto industry, intent to learn all he could. He worked as a sales manager at a Honda dealership, while researching alternative energies. As owner of snowboard clothing company Athena, he also brought his knowledge of manufacturing and assembly to Envia. "Going from a piece of clothing to a car sounds very different, but in fact, the process is not that different," he says. A year ago he formed the privately funded Envia and has now partnered with Metro Ford Motors in Port Coquitlam, one of the largest fleet vehicle dealers in Western Canada, to convert gas-powered Fords to electric and hybrid-electric vehicles. The partnership is only with Metro Ford, not Ford Canada, its parent company. Metro Ford commercial sales manager Ken Zutz says that Ford Canada was not interested in working with Envia because Ford is working on ideas for all of North America and at present this project is just for a local market, but Metro saw an opportunity. "We're always looking for an extra step to get into a market where we don't see a lot of competition," says Zutz, who approached Giraud after he heard about Envia through a customer. With the cost of electric vehicle technology still too high for the average consumer — a conversion can cost $25,000 or more - Giraud is taking aim at the fleet market as municipalities face carbon emissions mandates and budget constraints, and private companies look for ways to cut fuel costs. By focusing on only a handful of Ford models, including the Escape, Ranger, F-150 and Fusion, Giraud believes he can streamline the conversion process, making the technology more affordable for his clients. Zutz adds that as municipalities struggle with fuel costs reaching into the millions of dollars each year, electric vehicles and hybrids have become more attractive options. "I was at a conference in Whistler with all the municipal managers and when we announced we were working on this project, they all went nuts. They were ready to place orders right there." Giraud plans to convert 1,000 Ford vehicles to electric or hybrid models by the end of next year. He has already delivered a test model, a fully electric 2008 Ford Ranger, to Metro Ford and plans to have three more test models done by the end of 2008. "So far I'm very impressed," says Zutz. And that's just the beginning. At present, fleet owners can purchase new vehicles from Metro Ford Motors and then have them converted to electric at Giraud's facility, which has a staff of 10. But Envia is in talks with other facilities in Ontario, California and Oregon as part of its strategy to expand in North America. Giraud says that despite the current high price tag attached to conversions, there has been substantial consumer interest in his company's services and Envia hopes to start offering conversions to individuals in late 2009. "You always have the early adopters who will pay for conversions no matter what the cost. Consumers are motivated by doing the right thing," he says. In the meantime, Envia will also convert old Fords in fleets, which can add years to the life of aging models. "Our opportunity really lies in converting all the old cars out there. It's a far larger market than the new auto market," Giraud says. He adds that building a new electric or hybrid car produces a significant amount of carbon emissions, but converting an old one will not use as many resources. "This really is the highest level of reusing." Giraud admits that switching vehicles from gasoline engines to electric motors is initially expensive, but by dealing in large quantities with fleet customers, he says the volume levels will reduce the costs. He draws a comparison to laptops and cellphones, whose costs have come down considerably over the years, saying the same thing will happen to electric vehicle technology. "I think you will see a pretty major reduction in the price of batteries over the next few years," he says. With new lithium-ion battery technology, Envia will also be able to customize the vehicles to suit different demands. For example, if a city's parks and recreation truck only travels 40 kilometres in a day, the battery's capabilities would be matched accordingly. Giraud estimates the life of a fleet vehicle is about 10 years. In that time, an electric vehicle would earn back its cost in fuel savings two times over. Vancouver's Angel Restoration is the first company to commit to a 10-conversion purchase order over the next year from Envia. Angel Restoration cleans up properties damaged by the elements and has about 40 Fords in its fleet. "With the increase in gas prices and our desire to be more sustainable, we would really like to have the whole fleet changed over," says operations manager Cam McLeod. McLeod says his company spends thousands of dollars per month on fuel, so the investment will pay for itself. "It makes economic sense but we also want to be socially responsible, and the more commitment we have to this now, the easier it's going to be for all of us." McLeod does admit that Angel Restoration's switch to hybrid and electric has required some planning in terms of how the company operates. "We have to look at logistics: does the person who is driving have the ability to charge the vehicle at various stops," he says. Giraud says there is already a basic built-in electric infrastructure, especially in colder climates, where plug-in outlets are available in many areas for block heaters. There are also no concerns about starting electric vehicles in cold weather, as there are with gasoline or diesel engines, which could help build interest in electric vehicles, he says. Bringing electric infrastructure to the point where recharging outlets are as available and convenient as gas stations will ultimately depend on the number of electric cars on the road, adds Giraud.